An old West Virginia Hillbilly saying---------- A person is inclined to think, "I am not going to forward anymore political e-mails." Then one like this comes along.. .. .. A picture is worth 1,000 words!! An old West Virginia Hillbilly saying:You cannot get the water to clear up,until you get the pigsout of the creek. This is great Tremblay! It needs to be a bigger image! I didn't think of doing that sorry. That is a great sig line there Tremblay! how anyone thinks that our country can survive this and recover is beyond me. We are in worse shape than Greece. I don't buy that for a second. I'm not an Obama fan but, seriously, there is no way that is true. Period. OK who wrote the peice ???? 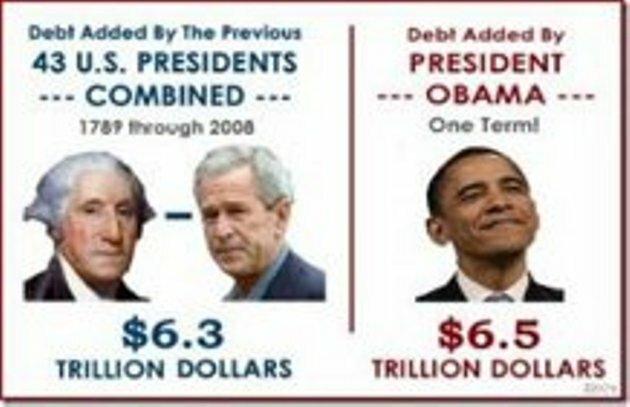 Apparently when the big (uh-)O took office the total debt was just over $10.6 trillion. Now it is almost $15.8 trillion. Increase of 48% in less than one term. together, Democrats and Republicans alike. drive with your headlights ON during the day. with your headlights OFF at night. with your headlights OFF at night. Together, we can make it happen. Thank you! thankyou for that thought it has given me the lift I needed.